This Retromatic could easily sit with Gary Clark Jr's swampy blues, Mike Campbell's rootsier rock or Kenny Burrell's bluesier jazz - and it's a great guitar to help you find your own voice. Offers something unique. Plays well. Excellently spec'd. With a market dominated by the same old brands and - for the most part - the same old guitars, it's getting increasingly rare for a non-heritage company to take too many risks. And that's why this Peerless' Korean-made single-cut P3 semi is such a welcome change. Built like an ES-335 but slightly smaller, it's a bigger fish than a Les Paul but not so small that it puts off jazzers, especially when played seated. Still, while it does jazz very nicely, like the ES-335 (which was originally conceived as a 'jazz' guitar), it's far more versatile. "The P3 is a rather nice player, with a chunky shouldered C-shaped neck, very tidy medium jumbo fretwire and mother-of-pearl inlays"
The P3 is also a rather nice player, with a chunky shouldered C-shaped neck, very tidy medium jumbo fretwire and mother-of-pearl inlays. Overall, it's a bit on the weighty side, but aside from that and some rather spongy feeling tuners and extra-large Retromatic logo'd truss rod cover, there's little to dislike. The Stetsbar vibrato has been around for some years and is, seemingly, a rather over-engineered affair. This Stop-Tail version is designed to retrofit over the usual tune-o-matic and stud tailpiece arrangement of most Gibson solids and semis. If its Bigsby-like shimmer doesn't appeal, a vibrato-less P3 is £100 cheaper. In use, it has a light touch and super tuning stability. Aside from the usual volume and tone controls, we have a Varitone, an old passive (no batteries) circuit that offers five filtered sounds via its six positions: fully anti-clockwise, it has no effect on the pickup's output. Again, if that's not your bag, go for the P2 (£699) or the P1 (£599), which both sport just a single humbucker at the bridge. Speaking of the pickups, these are made by Peerless in Korea but designed by ace repairman and pickup specialist Matt Gleeson. It's little surprise, then, that plugged in, we're in for a bit of a treat. After your EMG-loaded shred machine, this P3 will sound positively weedy, but turn up your amp controls and a lovely clarity emerges, spikier on the bridge pickup, beautifully clean and mellow from that neck-placed single coil. Clean, the Varitone options sound almost effected; fully clockwise, there's a usable electro-acoustic voice, while the other positions sound a little peaky and nasal - they're great with a phaser, though! Try the same experiments with a crunchy amp, however, especially with retro effects such as analogue delay, tremolo and fuzz, and these filter settings take on a new textural dimension. 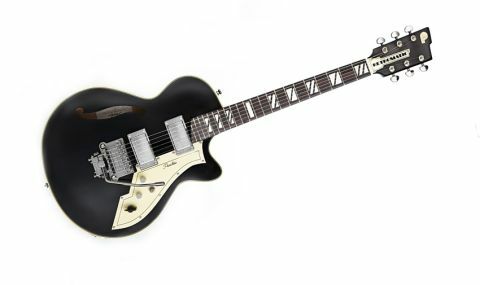 The Stetsbar performs its smooth Bigsby-like shimmers effortlessly, and while the semi nature might lack the midrange clout of, say, a Les Paul, the width and openness of the sound is impressive.